A comprehensive guide and fact sheet about Egyptian History. Discover fascinating facts and information about the civilization of ancient Egypt and Egyptian History. The Old Kingdom known as the "Age of the Pyramids"
Click a link for additional information and interesting facts about subjects relating to the civilization of ancient Egypt or other aspects of daily life, the people and places of ancient Egypt. The Intermediate periods brought only minor changes to the civilization, and the decline of the ancient Egyptian Empire occured when the Greeks and Romans conquered Egypt. Egyptologists and historians usually divide the history of ancient Egypt into 31 dynasties up to the arrival of Alexander the Great. The Kings of Egypt were not called 'Pharaoh' until the New Kingdom, however 'Pharaoh' is the term we commonly use today to describe all of the rulers and kings of ancient Egypt. The Queens of Egypt were also given the title of pharaoh. The following fact sheets provide a fast overview and short history of the civilization of ancient Egypt in an uncluttered and simple format, ideal for research and a fast appreciation of the history of Egyptian civilization for kids. Each fact sheet provides details of the main events during the main historical time periods of Egypt. Fact 3 on Egyptian History: Representations of most of their gods were depicted with the heads of humans but some were depicted as 'human hybrids' with the bodies of humans but with the heads of animals or supernatural creatures. Fact 17 on Egyptian History: Pyramid chambers were inscribed with spells for the afterlife - the Pyramid Texts were for the exclusive use of the Pharaohs. Fact 19 on Egyptian History: Building technology increased and three massive, smooth surfaced pyramids were built as the tombs of pharaohs at Giza. Fact 20 on Egyptian History: The Old Kingdom was called the "Age of the Pyramids." 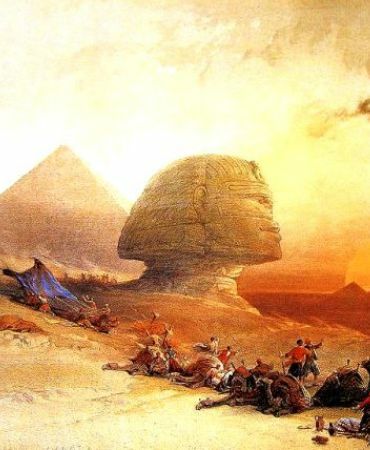 Historians divide Ancient Egyptian history into 31 dynasties. A Dynasty consisted of a succession of kings from the same family who succeeded each other on the throne by right of inheritance. Learn about the history and civilization of ancient Egypt the fast and easy way via the ancient Egyptian Historical Fact sheet. Short, brief and concise history facts and info. Fact 21 on Egyptian History: Internal and External power struggles. The Middle Kingdom Empire was overthrown by the invasion of the Hyksos, or shepherd princes from Asia, who ruled over Egypt, for several centuries. The Hyksos introduced the horse and the chariot to ancient Egypt. Fact 22 on Egyptian History: Military campaigns in Nubia. Fact 23 on Egyptian History: Fortresses were built and standing armies established. Fact 24 on Egyptian History: Feudal organization established, overseen by Nomarchs. Nomarchs were appointed to rule the 42 administrative and religious districts of ancient Egypt, called Nomes. Fact 25 on Egyptian History: Religion of ancient Egypt focused on funerary and mortuary religious beliefs. Fact 26 on Egyptian History: The Coffin Texts were created for ordinary Egyptians. Fact 28 on Egyptian History: Military expeditions: Eastern coast of the Mediterranean under Egyptian rule. The ancient Egyptians fought the Hittites for control of the highly lucrative trade routes to Mesopotamia. Fact 29 on Egyptian History: The Pharaoh Akhenaten (the father of Tutankhamen) established a new religious order at Armana worshipping the sun god Aten and banned the worship of other gods. Fact 30 on Egyptian History: The revolutionary changes of the Armana period of Akhenaten lasted for only for 16 years and the Egyptians revert back to the 'old' religion. Fact 31 on Egyptian History: Egypt conquers the African land of Nubia. Viceroys were appointed to control and collect tributes from the Nubians. Fact 32 on Egyptian History: Nubians retaliate & conquer Egypt but their stay in power lasted for less than one hundred years. Fact 33 on Egyptian History: Ancient Egyptians experienced the influences & cultures of foreign civilizations including their successful use of the chariot in ancient Egyptian warfare. Fact 34 on Egyptian History: The Pyramid Texts and the Coffin Texts evolve into the collective texts known as the Book of the Dead. Fact 35 on Egyptian History: There was a surge in funerary and mortuary religious beliefs of ancient Egyptians. Fact 36 on Egyptian History: Egyptian Priests acquire unprecedented power, and more religious cult centers emerged during this period. Fact 37 on Egyptian History: Period of great wealth, luxury and power, a new age of experiment and invention. Discover fast, interesting fun facts about the civilization of ancient Egypt for kids with some amazing, cool and quick information about ancient Egypt and Egyptians. Ideal for children, homework, schools, teachers and kids of all ages! Find fascinating fun facts about the civilization of ancient Egypt for kids and the history, culture and civilisation of the ancient Egyptians and ancient Egypt. Interesting, fun facts about the civilization of ancient Egypt for research, schools, students and kids of all ages. Short, brief and concise history facts and info. Fact 43 on Egypt Civilization: Military defeat of Persia by the Greeks at Marathon in 490 B.C . Fact 45 on Egypt Civilization: The Ptolemaic dynasty established by Alexander under his general who is created King Ptolemy I. Learning about the ancient Egyptians and Egyptian History inspires everyone to visit historical sites and undertake Egypt Travel and Tours to experience the wonders of this magical land at first hand. Many people choose to experience a tour of Egypt on a Nile Cruise stopping at the famous destinations and sites of Egypt such as the Pyramids of Giza and the Great Sphinx. The information and facts about Egyptian History will provide you with a great insight into Egypt and the legacy of the ancient Egyptians.